POSTCARD #109: New Delhi: The early morning flight from Bangkok to Delhi leaves in darkness and the sun rises along the way. It takes only three and a half hours; have breakfast, fall asleep, wake up and pretty soon we’re descending. Up go the flaps down go the wheels; we’re on the ground and rumbling along a bumpy runway. Get ready to go, reassemble the parts of who I am and out of the aircraft into the vast arrivals hall. A long walk to immigration, miles of pale tangerine carpeting, entry stamp on my passport thump. I’m through. Find a place at the luggage belt to stand and wait and watch the bags move past the centre of my vision. Feel dizzy… all journeys merge into one; can’t remember what my bag looks like, panic for a moment then remember. I see it, grab the handle, get it on its wheels and leave through the green Nothing-To-Declare exit. Driver is waiting, into the car and we’re away in the traffic. Adjust my watch back 1½ hours and step into an earlier time, a continuation of events that started before I got here. The flight from Bangkok disappears; a memory replaced by present-time experience – there’s no feeling of ‘me’ having arrived in Delhi, it’s like Delhi has arrived in ‘me’… outside in & inside out. Delhi fills my vision; all the sensations, noise and commotion of morning rush-hour traffic on the airport highway. 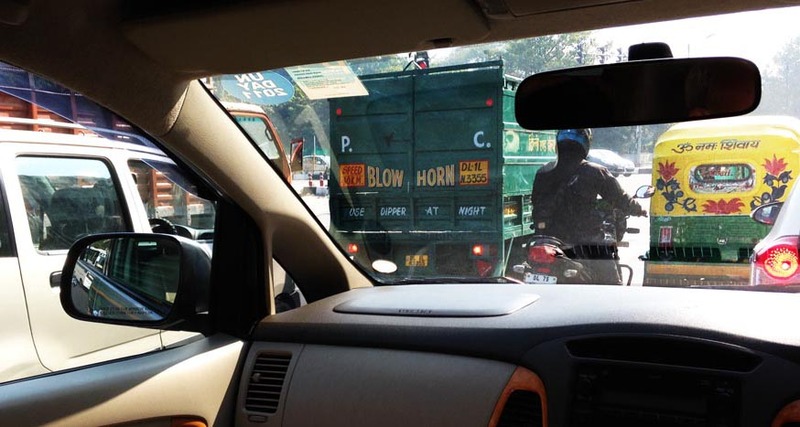 Car horns honking all around: pap-pap, pee-pee, pah-paah, PEEE…. There’s a hold-up, maybe there’s been an accident. What’s happening? The sound of car horns increases in volume, and slowly we get nearer and begin to see the cause of the obstruction. There’s a vehicle positioned right across the road, but it seems to be moving… wait and see. It looks like the driver is trying to turn round. Yes, he’s doing a three-point turn into the oncoming traffic. What? At this point, the noise of horns stops for a moment; uneasy silence, everybody thinking wow, we don’t know what’s going on here, but this guy must think he has a very good reason for deciding to do this, and they edge past him cautiously. The driver completes the turn, after many stops and starts as the flow of traffic continues to swerve past him whenever there’s a space to get through. Then he’s coming towards us, driving carefully against the traffic flow and assertively looking everybody in the eye. The first thing that comes to mind is: this is just so… wrong, and I’d like to dwell on how wrong it is, but it’s too weird – searching for something to blame, but can’t find anything with sufficient blameworthiness. One thing is certain; it must be pretty scary to be doing what he’s doing. I see him in silhouette as we pass, gripping the steering wheel, alert, tense, determined. I watch him through the rear window; an enigma, a complete reversal of everything we think of as logical. The rush of traffic engulfs him like water moves around a stone in a fast moving river, then he’s gone. Up front, in the normal directionality of things, we appear to be getting through the congestion. Traffic picks up speed, acceleration; honks, squeaks and toots all around as if the cars were jamming with each other in an improvisation by Miles Davis on trumpet. Love the imagery of this post Tiramit! Somehow these off moments that you describe so well here, heighten our awareness of how much we expect the familiar pattern of traffic to take place every time we are in a car. Love the way you take the reader with you landing in Delhi and directly into the streets. It is so vivid. And so like the descriptions my husband gives of Cairo where he lived for some time. All done with the bare bones of language which is so effective in getting us there with you, dizzy and awed. And I thank you for in some comment for some post you mentioned David Bingham and I have found him saying what Mooji says in a different way that is very helpful. Time is running out and I have to find some way of stepping back from anxiety and other feelings of the person. So thank you. Thank you for the link. I listened to it a second time. Do remember as a child having similar, almost mystical experiences? Did you? Think many children do. Could have been my Bipolar because the meds for that really put a wrinkle in Being. Anyhow thank you again. I remember lying in the garden looking up at the sky and clouds and getting kinda scared about the vast space entering. I think David Bingham is saying consciousness is so much greater than mind, and he found it’s possible to allow the smallness of mind to be swept away. In the context of our discussion, the body could then recover from the physiolgical effects of the meds… is it possible? Maybe encouraging to think it’s not impossible to unlock the holding on to the idea that it can’t be changed? Yes, I think you are right and it may be possible though difficult to circumvent the meds. Mooji says basically Bipolar is of the mind and the mind is identified with the ego not Awareness. I am not explaining it well but I am sure you understand. Beautiful and evocative, and all in a traffic jam! Being a Delhi guy myself, I loved that ball by ball commentary of the traffic imbroglio! My experience over recent years of landing at T-3 airport and then going into the city has been fairly uneventful. The road network access is much better and the way it occurs to me, the traffic discipline a mite better. Thanks, yes it’s orderly enough these days. I usually come in from the airport at the busy time and there are a couple of bottle-necks we get held up in, slow for a while but it moves in the end. I was writing about the extraordinary driver who decided to turn around and drive back through oncoming traffic. Any ideas what that could have been about?